Along with Mr. 7, Miss Fathers Day (ミス・ファーザーズデー, Misu Fāzāzu Dē) is part of the "Sniping" pair who apparently are deployed for jobs where sniping is necessary. 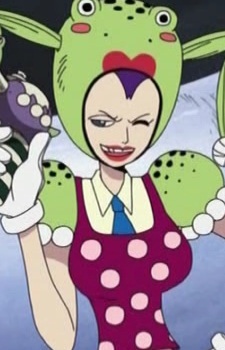 Miss Fathers Day has a strange sense of fashion involving frogs, and her Gero Gun is shaped like a frog and its bullets are shaped like frogs. Miss Father's Day shows up in the main story briefly during the climax of the Arabasta Kingdom storyline manning the giant cannon that Baroque Works has placed in the Arabasta capitol of Alubarna. Princess Vivi figures out the location of this cannon and, during the final moments of the battle of Alubarna, she (with the Straw Hat Crew's help) attacks it. Miss Fathers day and Mr. 7 attempt to stop her, but Vivi skillfully evades their gunfire and defeats them using her peacock slashers.